Ye Jian is one of China’s foremost ballet teachers and has been an ambassador of dance in Paris for more than 25 years. Graduated from the Shanghai Dance School and Beijing Dance Academy, Ye Jian taught at the Shanghai Dance School (during which time he taught our director Shi Zhongyi! ), before relocating to Paris in 1990. He performed more than 100 classical and modern dance roles in major companies across Europe, including English National Ballet, Geneva Ballet, Normandie Ballet Theatre and Toulouse Ballet Theatre. Following his stage career, Ye Jian gained the French National Dance Teacher Certificate and became a renowned instructor in Paris. He currently teaches at the Paris Academie International de Danse. In recognition of his status, he was invited to be a Judge and Chairman of the CCTV Dance Competition in Europe. “Ye Jian was one of my most important and memorable teachers. 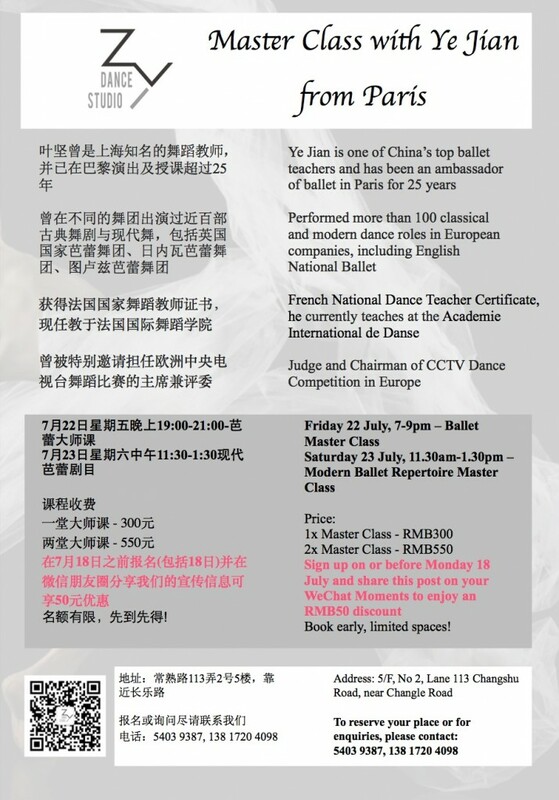 I’m very honoured that he will teach master classes at Zy Dance Studio this summer and encourage everyone who enjoys extending their dance knowledge and technique to experience classes with this master teacher,” says Shi Zhongyi, Director of Zy Dance Studio. To reserve your place or for enquiries, please visit the front desk or contact: (86 21) 5403 9387, 138 1720 4098. Book early, limited spaces!